Sensuous and spectacular, Dolce & Gabbana The One Eau de Parfum is the essence of luxury, bottled. The golden floral fragrance is one to be celebrated, tempting the senses with its statement character and endless charm. Its strength and uniqueness comes from its many contrasts, from the mouthwatering fruits of its opening, to the showstopping palette of white flowers at its heart. 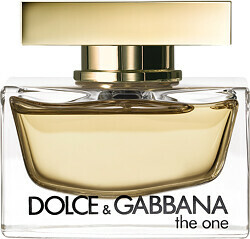 Dolce & Gabbana The One opens with sparkling bergamot and mandarin, blended with the juiciness of lychee and ripe peach. In the heart, an armful of Madonna lilies lend their statuesque beauty, before a seductive dry down of vanilla envelops the fragrance in creamy sweetness. Dolce & Gabbana The One Eau de Parfum Spray is rated 4.9 out of 5 by 11. Rated 5 out of 5 by Hally86 from Smell good all day This perfume is a very light floral mix that is beautifully combined to give a perfume that lasts all day. It would suit any age group and I am so pleased that I am now going to get a bigger bottle. Rated 5 out of 5 by sue1 from A Little treat I have been pondering for sometime whether to purchase this scent as a treat to myself as it is not one of the more cheap everyday perfumes. However after seeing the competitive price on Escentual I felt that it was more justified. It has very peachy undertones and is a great day and night scent. It lasts well and is not too overpowering. I bought it to cheer myself up after recovering for yet another operation on my knee and my husband commented on it. It has a very feminine appeal and I am very pleased that I know what a lovely smell it has, and I am now looking into the body lotions, The icing on the cake that he liked it so much he treated me by paying for it! So thank you to my husband and Thank you also to Escentual for the great price otherwise I would never have brought it in the first place!